Placer gold can be found in nearly every state in the United States. While much of the gold deposits throughout the west originated from gold veins located not far from the placers locations, much of the gold found in the East and Midwest are a result of glacial deposits. This gold is not native to the site that it is found; rather it was transported by moving glaciers and left behind as those same glaciers receded. This was not a one-time event. There have been many ice-ages over millions of years that resulted in massive glaciers moving down from Canada and covering the northern part of the United States. As these glaciers moved south, they brought with them debris from Canada that included rocks and gravel, some of which contained gold. As the glaciers slowly melted, they posited gravel all across the northern United States. Some of this gravel contained gold, and eventually found its way into waterways all across the country. These continuous glacial deposits have resulted in small amounts of placer gold being found all throughout the northern United States. This glacial gold is found in all the New England States, New York, Pennsylvania, Ohio, Michigan, Indiana, Illinois, Wisconsin, Iowa, Minnesota, Missouri, Kansas, Nebraska, and the Dakotas. The distribution of gold throughout this part of the United States is quite sporadic. Some of these states have native gold deposits that originated in the states also, but many of them have little to no natural gold within the state, so nearly all of the gold present comes as a result of these glacial deposits. As you can expect, there was no rules as to where to gold was left behind. Some areas got essentially no gold bearing gravel, while other areas were richer. The overall quantity of the gold left behind is generally much less than you would expect to find in the western United States. Although much of the deposits that were left behind were likely very rich, they were distributed so widely across the landscape that very few areas got appreciable amounts of gold in any one area. There are a few exceptions however, where significant deposits have been recovered. Most glacial gold is extremely fine textured. 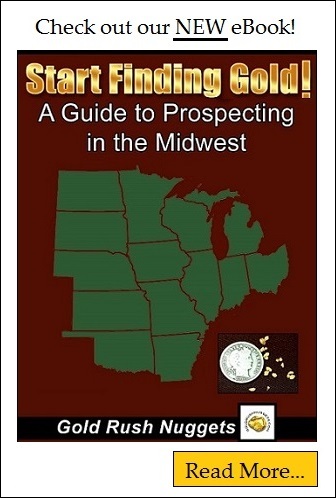 The occasional “picker” and nugget can sometimes be found, but most gold prospectors in the Midwest have found that by using techniques that are specifically designed for fine gold recovery will result in the highest yield. It is very rare to find a glacial gold deposit that can be considered commercially viable. Generally the gold is just to fine to accumulate enough to cover the high expenses associated with operating a gold mine. However, that is not to say that a recreational prospector can’t find paying quantities of placer gold if they search in the right areas. There are many prospectors in the Midwest and Northeast that area finding several ounces of gold each year by working these glacial gold deposits. They may not recover enough gold to consider it a full-time job, but there is certainly enough to cover expenses and maybe make a few bucks too. Since quantities of glacial gold are widespread and have not attracted much attention by commercial gold miners, there is limited documentation on where to find gold in these lesser-known gold bearing states. Researching where gold has been found before is always an important step in finding locations to prospect, and this is especially true in states with glacial gold.